PEROU – Guayaquil - Archaeologists have stumbled upon some interesting stone carvings in Guayaquil, a remote town about 65 kilometers from the northern city of Chiclayo. 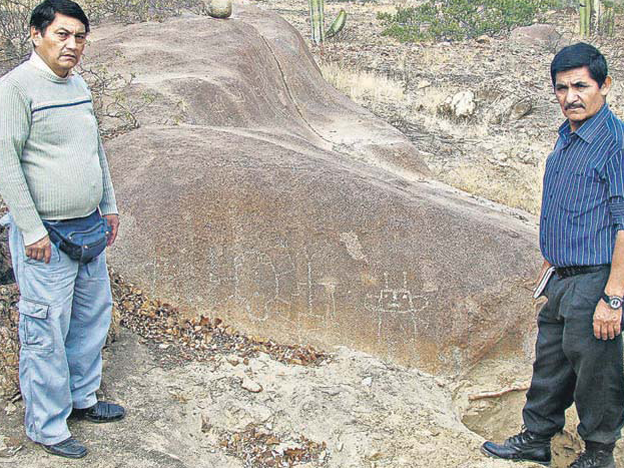 El Comercio reports that the petroglyphs were initially found two weeks ago, and included dozens of images etched in rock. 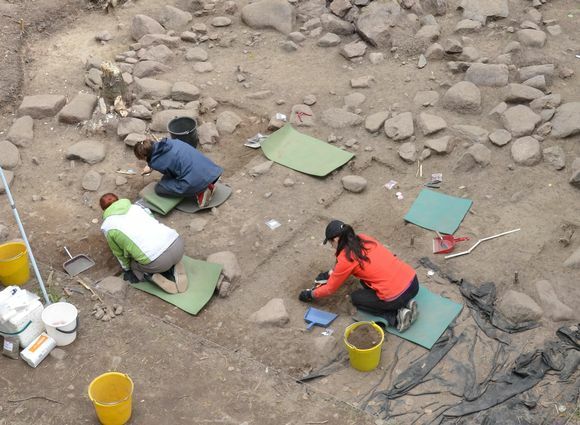 Experts told El Comercio that the site is probably 3,500-4,000 years old, which indicates that its creators may have been members of the Chavín civilization. One peculiar feature of the site is a large flat stone that has a number of carefully polished holes carved in it. According to El Comercio, this part of the site was probably an observatory, where religious authorities would have watched the skies for omens. The site is also home to a number of bizarre images etched into the stone. One large piece, which archaeologists believe may have served as an altar, includes several anthropomorphic and zoomorphic characters. El Comercio reports that one character in particular, a humanoid figure with antennas, has attracted locals’ attention. The figure’s resemblance to popular conceptions of extraterrestrial life forms has led some to postulate that the site may have been created by ancient aliens. However, archaeologists dismiss such claims. Carlos Elera, the director the Sicán Museum in Ferreñafe, told El Comercio that it’s likely that the figures incorporate features from a number of elements from nature. Though they may be strange, they are definitely earthly beings. Local authorities have requested that the site be named cultural patrimony of the nation, and are pursuing funding for a full excavation of the area. ROYAUME UNI – Stirling - A section of the highway, which was built around 2000 years ago and has been described as "the most important road in Scotland's history", was recently found under a car park in Stirling. Amazingly, the cobblestones discovered at Beechwood Park still bear the tracks of Roman carts ferrying legions north to battle the natives. The road, which follows a line from Doune in Stirlingshire to Falkirk then heads south to England, was later used by William Wallace and Bonnie Prince Charlie for military campaigns. The road fell out of use in around 1770 and was later built over. Archaeology Scotland now plans to uncover up to 200 metres of the road. USA – Owen Lake - When Koen Ergle first saw the rounded end of a nearly black log poking out of the sand in the lake near his home, the 7-year-old thought it was a giant muscle. But it soon became clear it was a near-pristine dugout canoe possibly hundreds of years old. “This is very complete, this is in very good shape. These are the ones we can really learn from,” said Julie Byrd of the State of Florida Division of Historical Resources, who was on site Thursday. Byrd measured, photographed and took samples from the canoe. 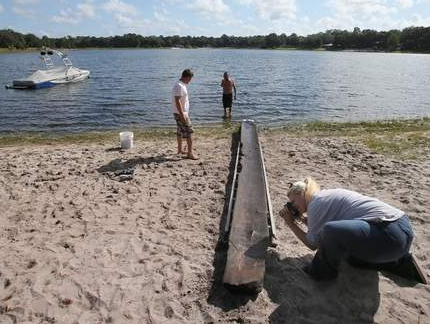 Some of the samples will be used to carbon date the canoe and others will be used to determine what kind of wood was used.“Many of the canoes found in Florida turn out to be made of pine, rather than cypress,” Byrd said. “It's really hard to tell if they are prehistoric or historic. We used to think that the more refined canoes came later, but that is not always the case. People have been living in this area for thousands of years, so that is why we are doing carbon dating.”It will take several months before the results are known. Marion County has been inhabited for at least 15,000 years. Despite being submerged for possibly centuries, the wood still showed signs of how the vessel was made, as charred areas could be seen on the dugout. Fire was used to burn out and make the wood easier to remove, forming the concave interior. Koen also found a shard of pottery near the canoe, which is thought to be up to 2,000 years old. TURQUIE – Kibyra - A Medusa mosaic that was unearthed in 2009 in the Odeon structure in the southern province of Burdur’s ancient city of Kibyra, had been kept away, untouched, for years. This year, for the first time, the mosaic was unraveled . About 95 percent of the mosaic remains despite being around 1,800 years old. “The mosaic is made up of thin, colored marble plaques. 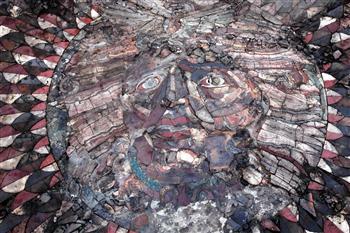 The technique used is called ‘Opus Sectile’ and there is no other Medusa in the world made with this technique,” said the head of excavations, Professor Şükrü Özüdoğru. Archaeological excavations in Kibyra have been in progress since 2009, unearthing artifacts and relics of historical significance. Özüdoğru said the city, which was a regional power in the Hellenistic period, was founded in 330 B.C. He also stated that the stadium, concert hall, parliamentary building, bath and theater all possessed an impressive structural integrity that had allowed them to survive to the present day. He said a 3,600-person-capacity Odeon structure unearthed in the ancient city was the only structure in the city covered with a roof, hence its functional capacity as a theater, court and parliamentary building in winter months. Özüdoğru said the Medusa was 11 meters in length, adding that they had opened the Medusa for checks for the first time. “In accordance with the reports of expert restorers, we closed the outer surface of the Medusa with five different layers. This year, we opened it so that it could be checked, and so that our restorers could carry out feasibility works on it.” He said the restorers had presented him with a report about the restoration and conservation of the Medusa. “Next year, we will restore the Medusa. After the restoration, the Medusa will be covered with glass and opened to visitors.” Özüdoğru said they had found another mosaic beneath the Odeon during excavations in 2011 and that the latter mosaic had been made with panels with 15 different geometric designs in white and gray colors. In Greek mythology, Medusa was a monster, generally described as having the face of a hideous human female with live venomous snakes in place of hair. Gazing directly upon her would turn onlookers to stone. Most sources describe her as the daughter of Phorcys and Ceto. Medusa was beheaded by the hero Perseus, who used her head as a weapon until he gave it to the goddess Athena to place on her shield. In classical antiquity, the image of the head of Medusa appeared in the device that fends off evil known as the Gorgoneion. FINLANDE – Ravattula - Archaeologists from Turku University found the well-preserved foundations of a stone church in the Ravattula district of Kaarina, just to the south of Turku. The church is believed to date from the 12th century. The medieval structure is believed to have been around 10 metres high and six metres wide, and to have contained a separate prayer room. Excavations on the eastern edge of the church also uncovered what is believed to be the base of an altar. The church is the first such structure found in Finland, despite 150 years of searching. Although burial grounds dating to the Iron Age and late medieval finds are common, no church had been found before the Kaarina ruins.